Lighting is an often overlooked way of bringing more elegance and pizzazz to your event. Your special event can become more memorable and unique by having wall and/or ceiling lighting. Dancing on clouds and having stars on the ceiling during your dances make the moment even more special. When your guests see the awesome dance floor lighting they will not be able to wait until they can dance along with the lights. 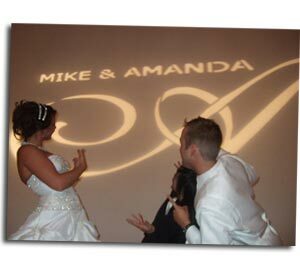 Your name, initials, or a customized design can also be shined onto the walls as a monogram. Planning out the right lighting for your event is not an easy task though, that is where your lighting vendor comes in. Your vendors experience will help you to decide which aspects of lighting are best for you. There are multiple things to keep in mind when picking your lighting packages, for example the size of your venue and your budget. Shining the right lighting can make everything look better. The phrase looking through rose colored glasses comes from this point. Your guests, decorations, cake and flowers will all benefit from having the right lighting in your room. The most anticipated period of any event with a Michigan DJ or live band is the dancing. Properly lighting your dance floor further encourages your guests to make the full use of your dance floor. Your guests will feel like they are at the hippest dance club with the lights which enhance the mood. The lighting affect can be changed with the mood and beat of your song. This brings you and your guests further into the moment and even the worst dancers will enjoy dancing the night away. Wall washes are another commonly used lighting component. Having a wash of one color on the walls and a different color on the ceiling can perfectly alter the look of your room. Even a tent can greatly benefit from the use of wall and ceiling washes. Theme-oriented patterns or just geometric patterns can also be projected onto the walls. 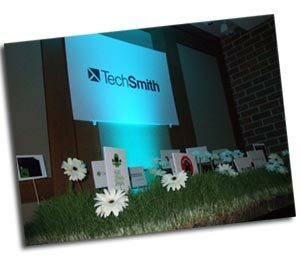 This is the perfect display of a company logo during a company holiday party or get together. The room should never be too dark, yet nothing is worse than going to an event that uses house lighting on at 100 percent. A room wash solves this dilemma quite easily. The room wash also provides ambiance in your event location. Using a colored wash will give the room a warm glow which will draw in guests of your event and make them feel at ease and comfortable. Your floral arrangements and centerpieces can also be guaranteed to be noticed by lighting them with a small light (pin spot). Guests with more deliberately see the details of your centerpieces when they are accented with lighting. The colors and elaborateness of the floral arrangements will be marveled at when they are accented with lighting. Your cake features are also enhanced by having the right type of light shining upon it. How many pin spots do you typically use at a wedding? I assume you light up the cake…. what else do you highlight? Do you use more than one on the cake and at what angles? Usually it is one per table. If you are looking for a permanent solution to offer clients, have your electrician install overhead track-lighting in the ceiling. This will give you more versatility with room layouts. Typically you will use (1) pin spot per center piece, this also goes for the cake. The more the beam angel is coming from the top, the better the effect. The biggest concern with center piece pin spotting is getting the light in guests eyes. It is important to do a quick check, by sitting in the seats really quick for last minute adjustments.